The HSA and Historical Discourses would like to invite students, faculty members, and the general public to the launch party of the 2015 issues of our journal! This will be a casual event for us not only to celebrate another edition of Historical Discourses (the Beyonce of McGill undergraduate publications), but to mingle with fellow history students over a glass of wine and a shared sense of jealousy towards ten writers who clearly have it together. 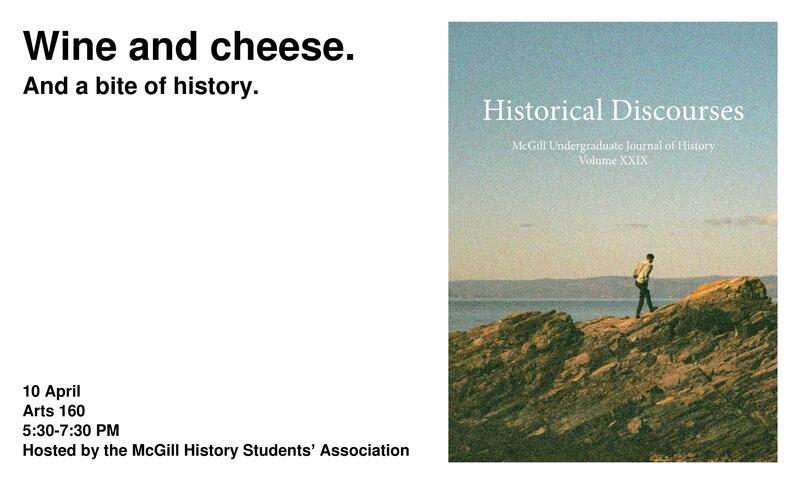 It is with great pride and pleasure that we present the twenty-ninth edition of Historical Discourses, McGill University’s undergraduate history journal. As a representation and celebration of undergraduate writing, the journal is faced with the daunting task of selecting the best pieces to showcase each year. While we had a tremendous number of outstanding submissions this year, we believe that this year’s ten papers uniquely demonstrate the diversity and excellence of historical scholarship at the undergraduate level.